ROSS HARRIS (b.1945): Symphony No. 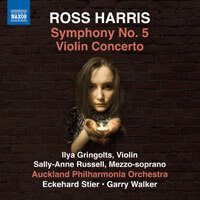 5 (w/Sally-Anne Russell [mezzo]), Violin Concerto (Ilya Gringolts [violin]). Description: The seven-movement symphony, lasting about three-quarters of an hour, takes its inspiration from the harrowing wartime reminiscences of Panni Palasti in poems that evoke the terrors of the siege of Budapest, of hiding in shelters and cellars from the Gestapo. Three of her poems form the central section of the work, in three short movements separated by violent scherzi, brutal, sardonic and vulgar. The poems are set to simple, beautiful melodies with a restrained, even serene, accompaniment, highlighting the extreme contrast between their unsentimental, literal and undramatized recounting of the day to day facts of living through horrors and the brutality of the outside world that threatens to kick the door down with its jackboots at any moment. Shostakovich pretty much wrote the book on the musical vocabulary to express this sort of thing, so unsurprisingly he looms large in the background to this symphony, but the musical content is Harris' own, ably expressing himself in the established idiom. The piece is bracketed by longer instrumental movements, both slow and solemn, simultaneously lamenting and consoling. The Violin Concerto is in one continuous span, with a dramatic arc that traverses five contrasting sections that form an arch structure, beginning and ending with hesitant, fragmentary gestures from the soloist, who occupies the limelight throughout the main action of the work. The composer's language is firmly based in tonality, though with widely varying degrees of freedom and dissonance. Influences seem to be Prokofiev, Shostakovich, Bartók and Berg, moving between styles within this broad general bracket with fluidity as demanded by the dramatic narrative. One of the work's most beguiling features is the composer's fondness for setting up an episode of taut, thorny argument and then resolving it into ravishing late-romantic harmony. Auckland Philharmonia Orchestra; Garry Walker, Eckehard Stier (Symphony).